Mr. 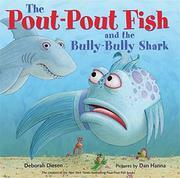 Fish and his friends find their spines (well, maybe not the octopus or the squid…) when dealing with a shark. Tummy Tickle Park is the stuff of children’s dreams: swings, monkey bars, a phenomenal slide—and one mean bully of a shark. This meanie repeatedly tells the friends to scram, though strangely, no reason is given or shown as to why he wants the park to himself. The fish don’t leave, instead just flattening themselves to the ocean floor or hiding. “Shark acted badly. / Being mean is wrong. / But I’m just one fish! / Am I really that strong?” Mr. Fish wonders. After the third pass from the shark (and iteration of Mr. Fish’s lament), Mr. Fish finds his strength, especially with his friends swimming beside him. The bullying magically stops when Mr. Fish uses his words (“Bully isn’t who you are, / But it is what you have done”) and demands respect. Facilely, the final scenes show Shark studying etiquette and then joining the fun. While repetition, especially in a rhyming book like this one, can reinforce a book’s message and give listeners an active role in chiming in on the refrains, this one pushes the idea too far, repeating large sections of three different stanzas throughout. Hanna’s artwork is full of humorous details that will keep kids poring over the pages, but the scared expressions on the creatures are a bit forced.